So much talk of potatoes this week. I find myself becoming excited just talking about potatoes and the planting and harvesting of those starchy wonders. I love potatoes. There, I've said it. I'll have you know that Blackfoot, Idaho is the potato capital of the world. I don't know how the world decided that Blackfoot is the capital, but that's just how it is folks so deal with it or better yet, eat a potato. Blackfoot even has a potato museum with a giant potato out front. 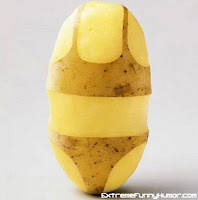 It's not a real potato, but it's great place to bungee jump off of, it's that large of a potato. Being from Blackfoot, I felt it my civic or potato duty to work in a potato processing plant one summer. The pay was great for a college student and who knew I'd reconnect with so many friends from high school. No need to attend my class reunion, I saw them everyday at work. Maybe not everyday because I only lasted 12 hours. I'm getting ahead of myself. I was put to work in the scalloped potato room. The smell was awful and the potatoes danced by me on a conveyor belt. Watching the potatoes do the swing was enough to upset my stomach and send me straight to the garbage can. The best part was that it was all caught on video and soon my supervisor showed up with some peppermints. "Don't worry, a lot of people throw up on their first day. It'll get better." Better? Of course things will get better. I knew in that moment I would not be going back...ever again. I lasted the 12 hours with my best friend can, as in garbage can, and waited patiently for my ride. I got home and announced I wasn't going back and my parents knew I was serious. Oh the joy of potatoes. Idaho cares about the education of the children of the future so much so that we had the best art supplies-a potato. I've never had a better stamp in my life. Try it. It's inexpensive and when you are finished with the art project, you can cut the potato into fries and eat them as a snack. Speaking of eating potatoes, I have a huge bag of potatoes at my place, so stop by for some art lessons and fries. See you soon. I KNEW everyone from Idaho had to love potatoes! If that weren't the case, why would I find myself irresistibly drawn to iron ore?